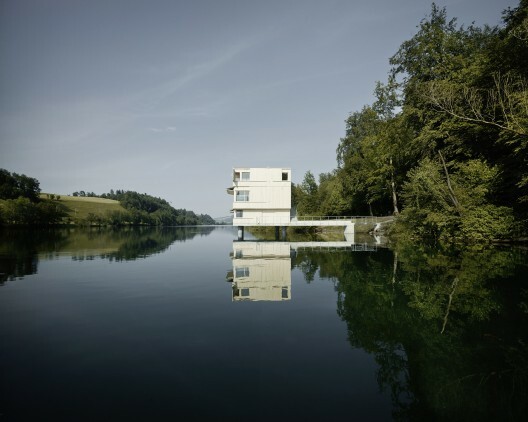 Lake Rotsee Refuge in Lucerne, is both practical and sculptural. The hybrid tower was purpose-built for rowing regattas that occur for just three weeks of every summer, and remains static, with shutters closed, for the majority of the year. When in use the three story high prefabricated wooden structure converts into a multi-level tower located on the finish line of the regatta. Perhaps though, it's most successful facade is that of its unused self. Shutters closed, the stacked unit building sits peacefully atop the picturesque lake, perched on its concrete platform, anchored close to the lakeshore, reflected in the water's surface and framed by the landscape behind. This subsequent sculptural manifestation, that subtly changes depending on where the viewer stands, is perhaps its most aesthetically pleasing moment.